We have Verizon FiOS in Long Island City, and in April 2012, our connection significantly worsened on the upstream. In March, our Verizon FiOS broadband had significantly improved, not in terms of upload and download speed, but the latency and packet loss had improved dramatically. I had posited that Verizon technicians had done some work to improve our connection. I was very happy. The monthly SamKnows report arrived today, and it looks like it reverted back to a pretty poor connection. SamKnows performs hourly tests for download, upload, latency, and packet loss. In April, our download speed remained robust at a little over the advertised 25 Mbps rate. However, around April 18th, the upload speed plunged to about 7 Mbps, less than a third of the advertised 25 Mbps rate. At the same time, the packet loss climbed dramatically suggesting that there was a compromised connection on the upstream causing this problem. This is unacceptable. The reason I came to Verizon was for the robust upstream. I upload a lot of files, as is the joy of being a media scholar and shutterbug, and I need a zippy symmetrical connection. If anyone in the neighborhood finds this and wants to report their results, please share in the comments. Whoa! Thanks for letting me know. It looks like my speed improved over night. I was averaging about 5 Mbps yesterday, and now I’m now I’m getting well over 31 Mbps! Latest update from Verizon is that they are going to try and roll-back the Motorola network hardware upgrades they did mid-April sometime within the next 7 days. The change should take overnight. Once it does call in and request 1 month refund! Mention the multiple tickets and regional/global ticket they have out for this issue. I even mention your blog post to the support tech, 2nd/3rd level network tech who I talked to on the phone. Same story as well here in Greenpoint (or “Long Island City” as Verizon considers it.) 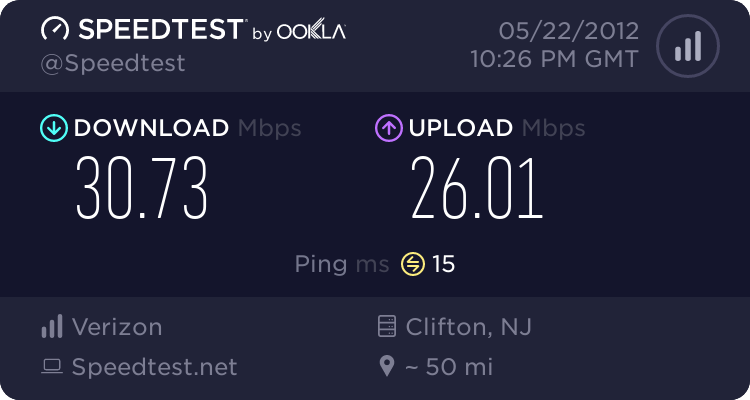 My service (15 down/5 up) was installed May 1st and the issues were immediately obvious after installation via a speed test. The tech knew there was already an issue in the area and said there was back and forth between Motorola and Verizon on who was to actually blame and couldn’t give me an ETA on a fix. I do indeed get almost 15 down, but only around 0.15 up. The worst is the randomly dropped connections/packet loss which disrupts anything I was doing. Anyway, I have 30 days to cancel the contract… Just hope they put a fix in or revert the firmware! Thanks for blogging about this issue. Thanks for confirming this issue and letting me know about your situation. I checked the SamKnows report and it still shows <8 Mbps upload. We deserve a make-good: like a month or two of free video service. Same issue here in LIC. My upload is down to 3-6Mbps Verizon tech confirmed that hardware upstream from us (some Motorola gateways) have been upgraded recently with modified vendor firmware. This supposedly caused all LIC and most of Queens FIOS users to share the same fate. They are working to repair the issue with no real ETA. Sad part is most users won’t even notice, or report it.